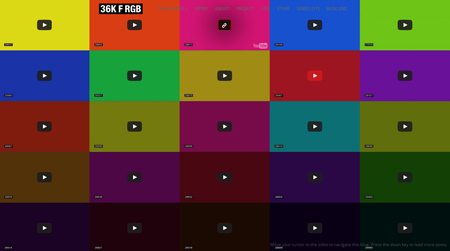 An interactive, meditative color-matrix of all episodes 36KFRGB, mosaic arranged. The matrix website: frames.eternaltrend.de is projected live on screen. Via an interface, the viewer has the opportunity to start, stop, fast-forward the individual episodes, what the colors of each episode frames as well as the matrix itself will change.